“What type of Texel Ram should I buy?” is a question often asked by both pedigree breeders and commercial sheep farmers. Flor Ryan, with the Irish Texel Sheep Society says that what both pedigree breeders and commercial sheep farmers should look for is a well muscled sheep with rounded gigots, square quarters, well fleshed loin and correct of mouth and legs. The gigot area (leg of lamb) should be as wide and deep as possible with solid muscling down to the hock. This gives a football shaped appearance to gigots. (Most valuable part of carcass). The area between the last rib of the sheep and the tail head should be as long and wide as possible with deep fleshing and muscling. (One of the most valuable parts of the carcass). The loin should be wide and well muscled maintaining its width towards the shoulder. Avoid: Softness around the tail head area (indicates fat, not lean). 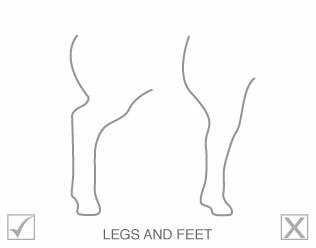 Texel legs should be capable of carrying a muscular body. Legs should be covered with white hair. Back legs should be well sprung from the hocks. Sheep should be up on their pasterns. Hooves should be solid black and meet the ground squarely. 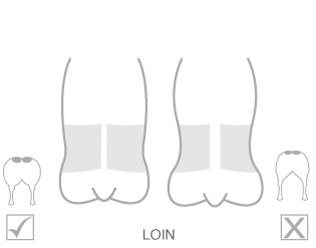 Avoid: Weak pasterns; Bandy hocks; Bowed front legs; Whiteness in hooves (leads to soft hooves); Excessive brown hair. The length of the head is approximately one and a half times its width, the muzzle is wide with nose flared and black eyedrops also black pigment, short white fine hair should cover the head. Texels should have a deep jaw line, teeth should meet the dental pad correctly. Avoid over and under shot sheep. 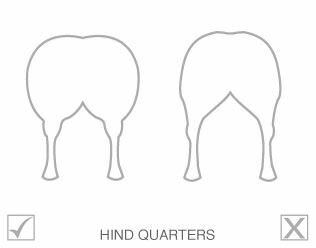 Avoid: Very large heads; Pink, white or grey nosed sheep (leads to white and soft hooves); Brown hair. The body length should give a balanced sheep with a level back and well sprung ribs. 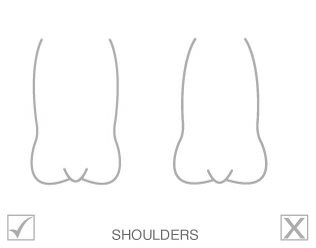 Avoid: Slackness on the shoulder; Long narrow (sausage type) bodies. Texel shoulders should be flat on top and no wider than the rib cage. Avoid: Sharp shoulders; Heavy brisket. Wool should be highly crinkled and with close staple (lambs with tight wool will have excellent thrive and good kill-out).